To set the scene at a national level, this is the story in terms of supply, demand and vacancy across the whole of UK offices. It’s a really positive story if you’re a holder of a UK office asset. National vacancies have plummeted to cyclical lows, standing at just under 6% at the end of 2018, following another strong year of demand and a fairly weak supply. If we look at the forecast, supply is expected to ramp up, but vacancies are expected to remain fairly low compared to historic levels and it’s worth noting that most of the supply set to deliver this year is in London. In fact, it will be London’s busiest year for new supply since 2003. Drilling down to a market level, there has been strong demand for prime space driving net absorption in the big cities. Figure 1 ranks UK markets by the amount of four and five Star (prime) office space that has been absorbed over the last 12 months. It has been a very strong year for London, but also for Leeds, Manchester, Berkshire and North Hampshire, Birmingham and Glasgow, where tenants have taken the opportunity to upgrade or expand into some of the new space that has been delivered. A couple of other themes have stood out. Net absorption, especially in London, continues to be driven by the Technology, Media and Telecom (TMT) sector. And of course a standout theme in London has been the meteoric rise of co-working (or serviced offices). Although serviced office leasing did fall in 2018 from 2017’s record high, at more than 2 million square feet it was still the second-strongest year on record. Despite WeWork taking less space than in 2017, the firm have still cemented their position as the top holder of office space in London at just over 3 million square feet, with more deals likely in 2019. There are the knock-on impacts to this burgeoning trend that we have noticed in our data. One is a rise in vacancy in smaller buildings, with many SMEs and start-ups (particularly in the TMT sector) gravitating towards WeWork-type space at the expense of signing more conventional deals in smaller buildings, which they may have done five or ten years ago. Figure 2 looks at availability rates in buildings of less than 20,000 sq ft in central London (about 80% of buildings by number), so there are lots of landlords being impacted. Since WeWork first took space at the end of 2014 the availability rate has nearly doubled. Whilst still fairly low, this is something for landlords and owners of these buildings to monitor – customer care and flexible lease terms will increasingly be the way forward. 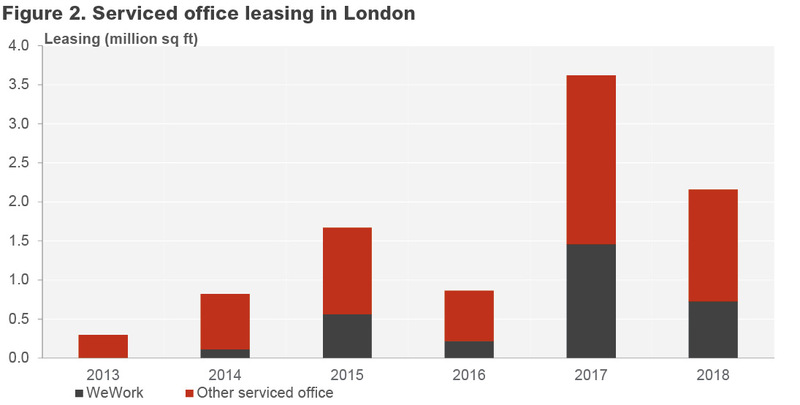 Moving out to the regions, serviced office take-up fell in London last year but it held up well in the regions, with around 0.5 million sq ft matching the levels recorded in 2017. Serviced office leasing in the regions as a proportion of all UK serviced office leasing rose sharply in 2018, to just above 25%. Manchester has been a key target. WeWork took the first two spaces outside of London in Manchester towards the end of 2017, with many other providers also in expansion mode. Spaces signed one of Manchester’s largest lease deals last year, taking just over 80,000 sq ft at Peter House. Spaces is also expanding into other big cities like Birmingham, Glasgow and Aberdeen. However, the vacancy impact on smaller buildings that we have seen in London has not yet been visible in Manchester. The availability rate has not increased within this subset, so perhaps the abundance of tech firms has not yet reached that critical mass to have an impact on the wider market there.